Robot Mode: There are certain elements any toy named Cliffjumper must have, no matter whether or not it’s a Bumblebee repaint (as they usually are). Anyway, a Cliffjumper needs to be red (check! ), he needs to be a battle-happy psycho (check! ), and he needs to have horns (double check!). Prime Cliffjumper fully adheres to all these criteria and as bonus he’s not even a Bumblebee repaint for once (that dubious honour will be reserved for Hot Shot this time around). Cliffjumper is a highly articulated robot despite his somewhat bulky proportions. He has pretty much all the joints one could ask for. He even has twisting wrists, though the casing of his forearms gets in the way here, so he can’t twist them fully. His wrists also hold his sole gimmick, he can exchange either or both hands for triple-barrelled guns. This makes him (at least at this time) the only Prime toy to have the exact same long-range weapons he has in the TV show. As far as the design goes, I really like the look of this guy. The head looks great, a spitting image for the character we (briefly) saw on TV. The way the chest comes together takes a moment to figure out and it isn’t the most stable design in the world, but it works fine and looks cool, too. So really, I have no complaints at all about Cliffjumper’s robot mode. Very show-accurate, great articulation, nice gimmick, cool look. What more could you want? Alternate Mode: Cliffjumper transforms into a red muscle car that’s apparently a cross between a Plymouth Barracuda and a Dodge Challenger. Just quoting here guys, I know very little about cars of the non-transforming kind. The car has horns near the front, but unsurprisingly they are not the horns from Cliffjumper’s head (though that would have been a great feat of engineering). Overall the car looks pretty great. On my version the silver paint on the front grill was applied rather badly (it’s smeared on the hood somewhat), but such things happen it’s just a minor thing. Otherwise the detailing on the car is pretty great, including the aforementioned horns, the side-mounted exhaust pipes, and silver rims. The only slight drawback are the multiple seams in the car roof, but otherwise this is a very cool car mode. No gimmicks or anything here, just a cool muscle car. Good enough for me. Remarks: Cliffjumper was part of a big fake-out during the launch of the Transformers Prime TV series. He featured prominently in all the ads, starred in the prelude comic book, there was a lot of excitement (and some controversy) that wrestler Dwayne “the Rock” Johnson was hired as his voice actor... and then Cliffjumper died five minutes into the first episode. Okay, he briefly returned as an undead Terrorcon later on, but seriously, Johnson probably didn’t need more than ten minutes to record his lines and was out of the studio before anyone could smell what the Rock was cooking. Cheap media stunt or honest attempt to set the tone of a more mature series? You decide. The history of the toy is almost as remarkable, as the First Edition toys were cancelled in the US before most of them ever saw the light of day. 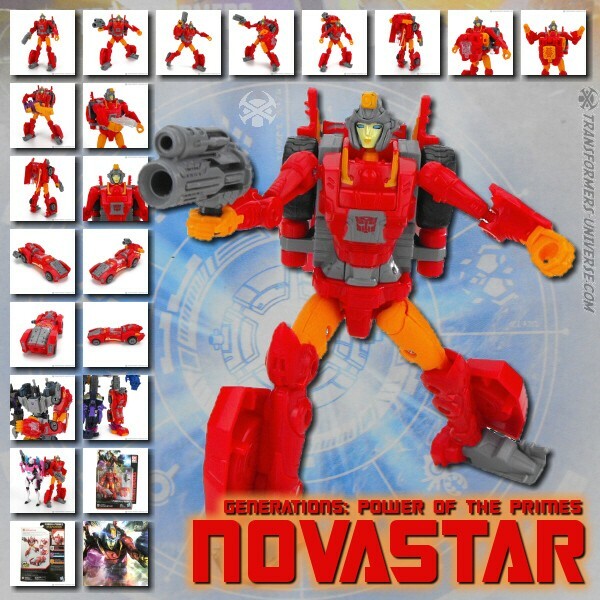 The Hasbro version of the figure - featuring somewhat lighter red paint and some minor detail differences - only came out in Canada and some parts of Asia, while the Takara version here had to be imported from Japan. Of course Cliffjumper will see lots more figures in the regular “Robots in Disguise” line, not bad for a guy who got killed five minutes into the pilot. Finally, the toy itself leaves little room for complaint. While it may lack anything truly spectacular, it is a great Deluxe-class Transformer figure without any flaws and very show-accurate to boot. The only slight downside to it is that you will be hard-pressed to find it for a decent price. Other than that: fully recommended.